The ITP was developed at the Woods Hole Oceanographic Institution. 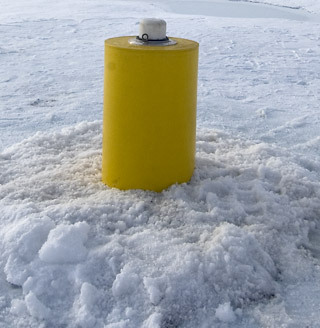 The core of the buoy system is a profiling instrument, which travels up and down a line hanging a half-mile below the ice floe. The profiler collects daily measurements of its position, plus the water pressure, temperature, and salt content of the water below. The ITP has enough battery power to last for three years in the ice, provided that its host floe remains intact (and it doesn’t get eaten by polar bears).